Time again for an update on the state record “front”. I have a handful to tell you about, plus another close call. This time most of the activity has been in the bowfishing category, but I have one underwater spearfishing record to report, and one rod & reel record. . . . Nine-year old Alex Weinrich from Pierce was fishing up on the Missouri River in Cedar County on October 14 when he reeled in a new state record Skipjack Herring. His fish weighed 2 pounds 14 ounces and beat the existing 24-year old record by almost a full pound! The old record was 2 pounds even. Alex caught his record Herring on a jig. Let me say a few words about Skipjack Herring in Nebraska. . . . There are a couple of species of fish in Nebraska waters that mistakenly are called “skipjack”. Goldeye are often wrongly called “skipjack” and at times some folks will refer to Gizzard Shad as “skipjack”. What Alex caught was a bona fide Skipjack Herring, a species that is quite common in other large U.S. rivers, but is uncommon in Nebraska’s Missouri River. 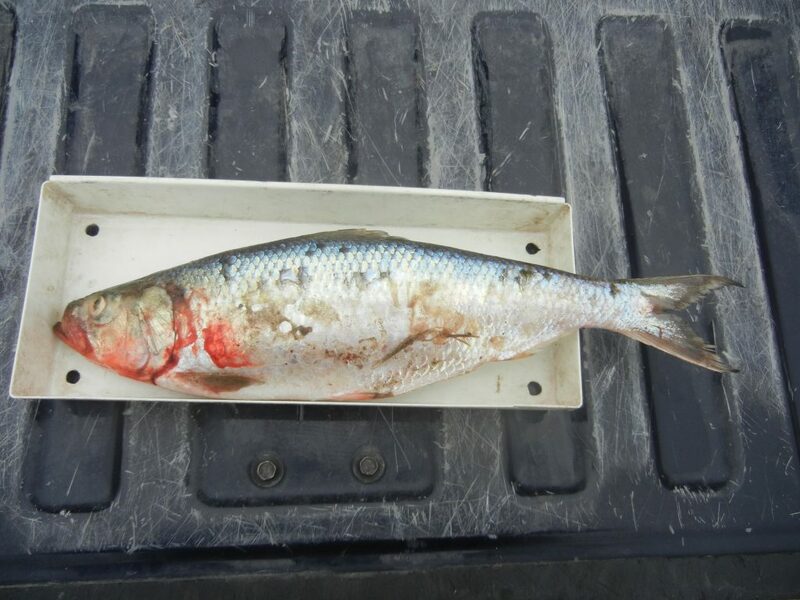 Although they are relatively uncommon, they can be caught on rod & reel and annually I hear reports of a Skipjack Herring being caught, usually in the Gavins Point tailwaters. I even stumbled onto one there myself one time. Nebraska has an underwater spearfishing season where fish can be taken from select waters. If you are interested in the details on those seasons and waters, make sure to see them in the Fishing Guide. 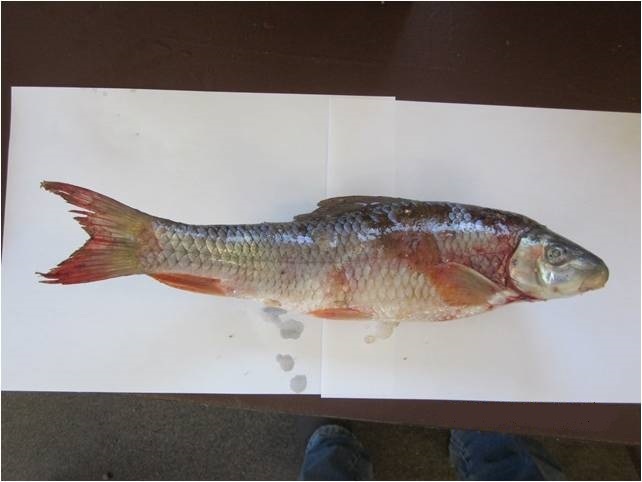 Lake McConaughy is one of the most popular underwater spearfishing waters and on July 25 Daniel Nelson from Ogallala established a state record for Shorthead Redhorse. Daniel’s fish weighed 1 pound 4 ounces. As you can see, Shorthead Redhorse is a species of sucker. We had some activity in the bowfishing category this fall. Part of the reason for that was the draining of some irrigation canals for inspections and repairs. When those canals are drained there are some fish that become stranded in certain sections and pools and yes, those fish can be legally taken by bowfishing. Again there is a season on the taking of game fish by archery, July 1 through December 31, and archers can take those fish from drained canals before the fish perish from lack of water. Tiger Trout are a Brook Trout X Brown Trout hybrid. I have recounted the story of Tiger Trout in Nebraska waters before, but let me give a brief review again: We have had the rare Tiger Trout show up in Pine Ridge streams where naturally-reproducing Brook Trout and Brown Trout were both present. In addition, in the last couple of years we have raised Tiger Trout and stocked them in a few Nebraska waters, one of which was Lake Ogallala. Fish from Lake Ogallala can and do exit that waterbody and end up in the North Platte River and Sutherland supply canal (also called Keystone Canal). The Sutherland supply canal was one that was drained this past fall and Herchel Huff from Sutherland was able to arrow a new state record there on September 26. Since being stocked in Nebraska waters, we have seen an upward progression in Tiger Trout state records. Our first bowfishing state record Tiger Trout was a 5-ouncer taken this past July (State Record Update, August 2016). Herchel’s fish was 8 times larger, 2 pounds 8 ounces! Tiger Trout have great growth potential, world records are up into double figures, so we will see just how big we can grow ’em in Nebraska! 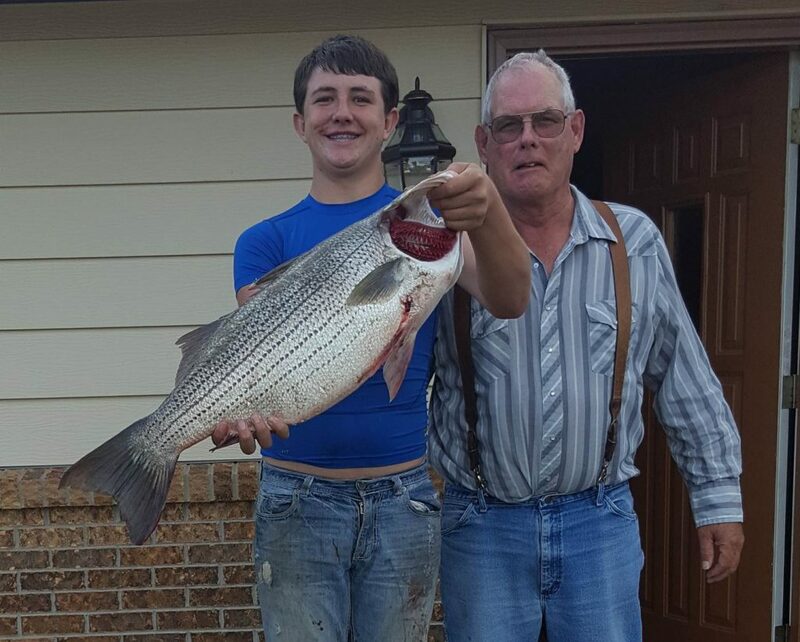 Also from the same canal, on October 2, Keegan Cummings of North Platte bowfished a new state record Hybrid Striped Bass (more commonly known as “Wiper”). Keegan is posing with his fish and his Grandpa Swedberg; I am pretty sure that Grandpa was as proud as Keegan! That Wiper weighed 15 pounds 9 ounces, and like the Tiger Trout above, blew away the previous record which stood at 11 pounds 12 ounces, also taken from the Sutherland supply canal back in 2013. Congratulations to all, some very nice fish! Your State Record Certificates will be coming in the mail. One story to tell this time about a missed opportunity to register a new state record. This one also involved a Tiger Trout, one caught by rod & reel, again from the Sutherland supply canal. The angler who caught it suspected that it was a Tiger Trout, but sent me a photo to verify. 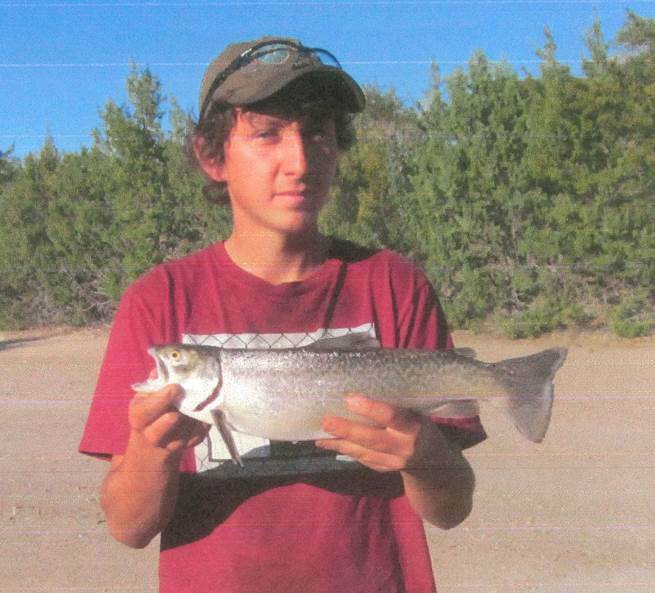 Sure enough, it was a Tiger Trout, a 19-inch 2.5-pound-plus Tiger Trout. As of right now, the rod & reel Tiger Trout state record stands at 1 pound 3 ounces, and the fish I saw in that e-mail was WAY bigger than that–more evidence that our current Tiger Trout records are not going to stand for long! Now, the angler who caught that fish may not have known it would have been a new state record, or he may not have cared. Whatever the case, be sure to familiarize yourself with the state record rules and existing records in any copy of the Fishing Guide, because the next time you GO FISH, you never know what you might catch!